Peel off the skins from the blanched almonds. In a preheated oven (180C) or on a skillet on low flame, allow them to toast for 5-10 minutes until lightly golden. You can also toast them in a microwave oven for 3-4 minutes until golden. Cook the penne pasta for the time mentioned on the packet, in this case 9-11 minutes. Drain and keep aside, reserving some of the pasta water. Bring a pan of water to boil. Make cross cuts on the base of the tomatoes and gently put them into boiling water for 2 minutes. Blanch them in cold water for a minute and peel off skins. Quarter the tomatoes, scoop out seeds, chop roughly and keep aside. To make the pesto, in a large mortar and pestle or a food processor, mash/process the basil, garlic, extra virgin olive oil and salt until smooth and creamy. To this add the almonds and mash / process until you get a smooth paste. Add the chopped tomatoes at this stage and mash / process until you get a chunky sauce. Add any leftover extra virgin olive oil and process until it forms a creamy sauce. Garnish with some fresh basil, halved cherry tomatoes and toasted breadcrumbs and serve immediately. Pesto Trapanese can be stored in an air tight container in the fridge (pour a thin layer of extra virgin olive oil on the top) for a week or so. 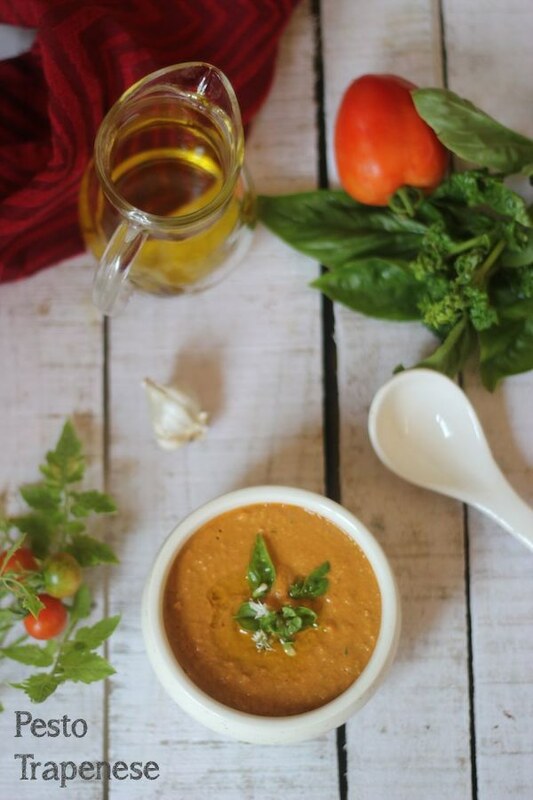 You can also use this sauce to coat grilled vegetables and grains to make a salad. *To make toasted breadcrumbs, tear 2 slices of bread roughly, add to food processor with a spoonful of olive oil and herbs, until you get crumbs. Transfer to a lined baking tray, spread out and bake for 3-4 minutes until golden in a 180C preheated oven. You can do this while toasting the almonds but make sure you keep an eye on them as they burn very quickly. Sneaking in almonds into this pesto is a perfect way to add a boost of health to a pasta dish for my kid, who otherwise dislikes most nuts. It’s also the best pesto to make when you have just a few sprigs of basil growing in your kitchen garden, and you want to put them to use. The pasta in Pesto Trapenese is full of the flavour of basil and tomatoes, with background flavours of the toasted almonds. Use the best tomatoes and extra virgin olive oil you can find, and try out this utterly simple, fully authentic yet unusual pasta recipe and wow your family and friends.